There was one moment in the first half at Selhurst Park on Monday night that stands out about everything else, that is already so ubiquitous on social media that it barely needs to be described in detail online anymore, other than to make a point. It was not Mohamed Salah's tumble, not James Milner's penalty, not Sadio Mane's swerving run and finish to kill the game. Anyone who watched the match, in the flesh or on television, will take one memory away from it, clearer than anything else: Naby Keita's assist that never was. In those four seconds of football, those five precise touches, Keita showed why he is the most talked-about midfielder in the world. Because modern football has tended towards specialisation in midfield roles. The 21st century has been the era of 4-2-3-1, a system that rigorously divides the midfield skills between different positions. A midfielder no longer has to master the whole game, but just a specific segment of it. Put 11 specialists together, and you eventually get the whole. But football evolves, and the way to beat a player who is good at one thing is with a player who is good at everything. That is why the most expensive signing in Premier League history is Paul Pogba. Whatever you think of his performances at Manchester United, and his fraying relationship with Jose Mourinho, there are not many players who have that technical precision, athletic range and flair in themselves at once. This is why the best player in the country is Kevin De Bruyne. You can call him Manchester City's engine room, because he delivers all their running power in the middle of the pitch. But that says nothing of his chessboard vision, which has been compared to Johan Cruyff, his mastery of every possible type of pass, or his ability just to sit deep in the middle of the pitch, barely break stride and run the game himself. This is the competition for Keita, up against the other futuristically complete midfielders of the Premier League. But look back at that little clip from Monday night and you see that his range of skills could be just as good as those of Pogba (below) or De Bruyne. First the technical skill, awareness and bravery to take the pass from Alisson just outside his box, with Andros Townsend breathing down his neck, and to take him out of the game with one flick of the inside of his right heel. Playing out from the back is dangerous and if Keita had got that wrong then Townsend would be in, bursting into the box, with the option to pass or shoot. Liverpool could have been 1-0 down after 22 minutes, facing an opponent with every incentive to sit as deep as possible. The easy option would have been to pass the buck back to Alisson, and let him go long instead. But that is not how Keita plays. Then there was the brisk forward dribble with the ball, from the edge of his own box up to the half-way line, cutting through the space Palace were retreating from. It is a rare skill in modern midfielders to run forward with the ball through that congested space. But that is what sets Keita apart. We have marvelled over the last decade at Mousa Dembele's ability to wriggle away from midfield opponents with the ball seemingly glued to his feet. Keita is like Dembele on fast-forward. Running with his head up, Keita knew he had Palace running backwards. Liverpool had not managed to get behind or around Palace up to that point, because it is difficult against two tightly packed banks of four that have been meticulously arranged by Roy Hodgson. But Salah knew this was his moment and he darted in behind Mamadou Sakho, and was finally free in space. Keita chipped a pass with right boot that went up and over the heads of the remaining three Palace midfielders, dropping beyond the whole Palace back four, and landed on the right boot of Salah, 40 yards away, on the edge of the box. Salah, for once, did not complete the job, losing control and lifting the ball over the bar. But how much does that matter? It cannot take anything away from Keita's little moment – he did everything that he could – and Liverpool won the game in the end anyway. 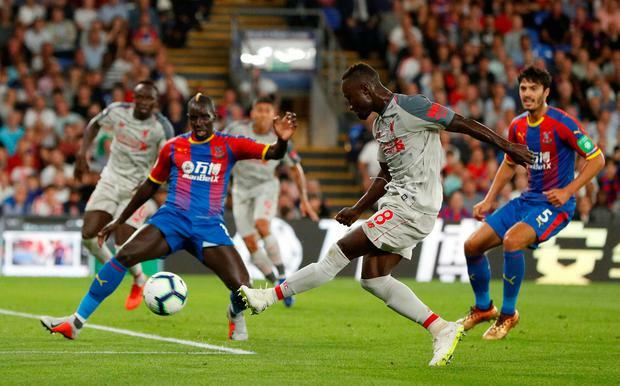 But this was about more than just Liverpool's attempts to find their way past Crystal Palace, or even about Keita finding his range in his second Premier League match. It was a message to the rest, and a warning. Liverpool have a new man in midfield who looks like he can do everything.